Horses: What Are Ermine Spots? Ermine spots on a horse are black or dark spots that appear in white markings just above the hoof. Ermine spots are also sometimes called "ermine marks." To be an ermine spot as opposed to just a regular spot or mark, ermine spots need to touch the coronary (aka "coronet") band. Below: Ermine spots, or ermine marks, on a horse. Below: A different photo showing the same horse as above. From this angle you can see that the horse has several ermine spots on both back legs. If a horse has ermine spots, the spots may affect the hoof coloring beneath them. For example, if a horse with pink hooves has ermine spots the areas of hoof that grow beneath them might be black, or at least darker. This is common, but it isn't a given. 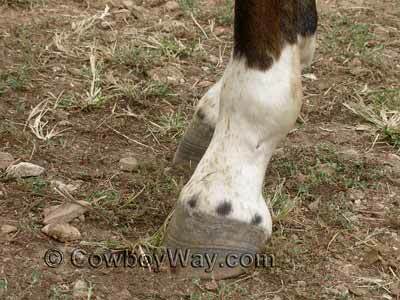 In addition to ermine spots, there's another name for spots on horses called "distal" spots. Both of these types of spots are small and located in areas of surrounding white. After that, there can be disagreement as to how they are defined, where they can be located (only above the hoof or anywhere on the body), and by which name they should be called, ermine spots or distal spots. 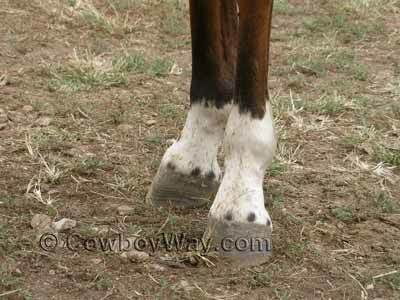 Even though not everyone agrees on the definition of an ermine spot, the way we have defined it on this page (black or dark spots that appear in white markings just above the hoof, touching the coronary band) has been in widespread use for a many years, so we're comfortable with using that definition here. Below: A spot surrounded by white in the middle of a horse's blaze. Depending on who you ask, this spot is called a distal spot or an ermine spot. Not everyone agrees. 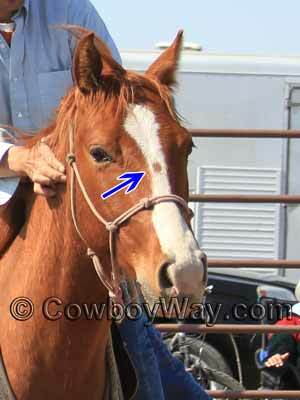 Here at CowboyWay.com we've been curious for a long time as to how ermine spots on horses got their name. While we've never been able to find an answer to this question, we have formed a theory. An "ermine" (also called a "stoat" or "weasel") is a furry mammal native to North America and Eurasia. It's famous for its luxurious fur that is brown on top and white on the belly during the summer. In the winter, though, it is beautifully, snowy white all over except for a black-tipped tail. 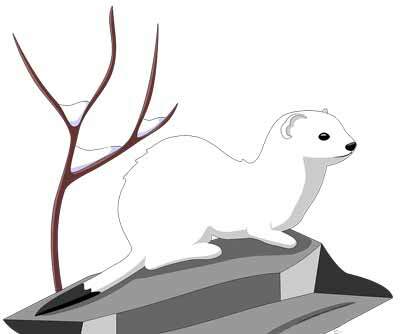 Below: A drawing of an ermine in its snowy white winter fur. Notice the black-tipped tail. In medieval times ermines were recognized for their beauty. Their white winter furs were frequently sewn together, which formed a sort of white-with-black-spots pattern because of their black-tipped tails. In addition to using the actual ermine furs, numerous cloth and tapestry designs of the time were based on an ermine's winter coloring. These types of designs on fabrics were called "ermine spots" or "ermine marks." So, somewhere along the way, we wonder if the description "ermine spots" and "ermine marks" made the jump from furs and fabrics to horse markings. Remember, this is just a guess. But it's kind of fun to think about.